We need your to help reach our goal of 1,000 UKnighted on March 30! This year, we will be tracking in real time the percentage of donors who identify as faculty/staff. 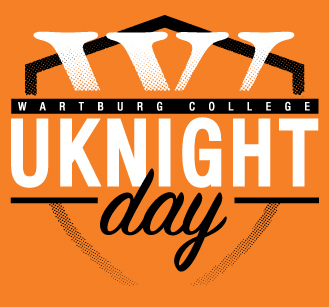 Make your gift and follow our progress at www.wartburg.edu/UKnightDay on Thursday. To help stock up on some Knight apparel, The Wartburg Store is offering a 20 percent discount on your entire order (including merchandise already on sale) when you use the discount code 1000UKD. The offer may not be combined with other in-store sale purchase discounts. Let’s be UKnighted! Wartburg College will celebrate Student Employment Appreciation Week April 2-8. During the week, we will recognize the outstanding contributions and achievements of our student employees and their supervisors. The Student Employment Office is asking departments to have their supervisors and student employees trace their hands on colored paper, cut them out, and submit them to Luther Hall 212 by Friday, March 31, as part of a campus-wide project for the celebratory week. Supplies are available in Luther Hall 212, if needed. Depart Sunday, April 2, for Loras Duhawk Invite; return late Monday, April 3. The Volunteer Action Center is hiring for an office coordinator, student organization liaison, and a community organization liaison (Fall Term with possibility of Winter Term as well). Applications are due by 4 p.m. Thursday, March 30. Interviews will be the following week. For an application, click here. Direct questions to vac@wartburg.edu.